For several years, I had a side company called FloSpace and it had exactly one product: FloPrompter, a teleprompter app for Windows PC computers. I conceptualized, designed, and programmed the entire app in C#. 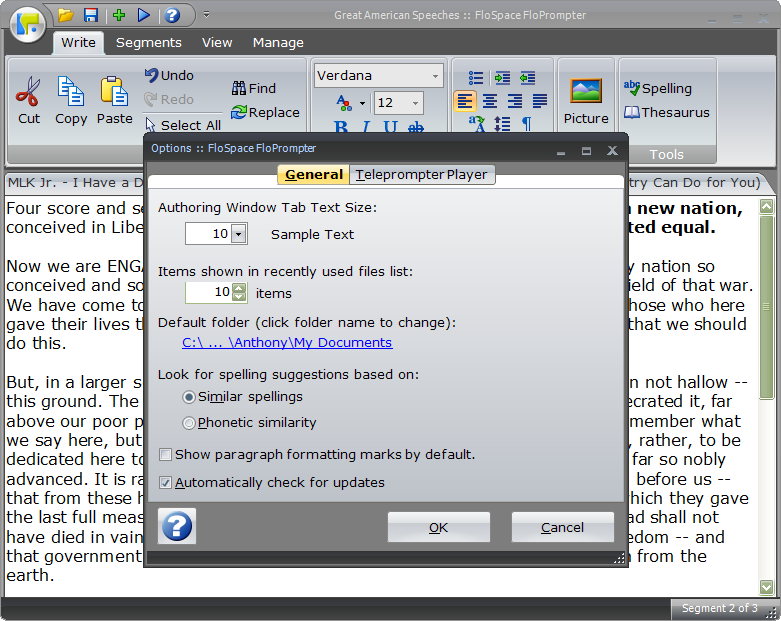 FloPrompter had two main components: a sophisticated wordprocessing window and a teleprompter window which displayed scrolling text. 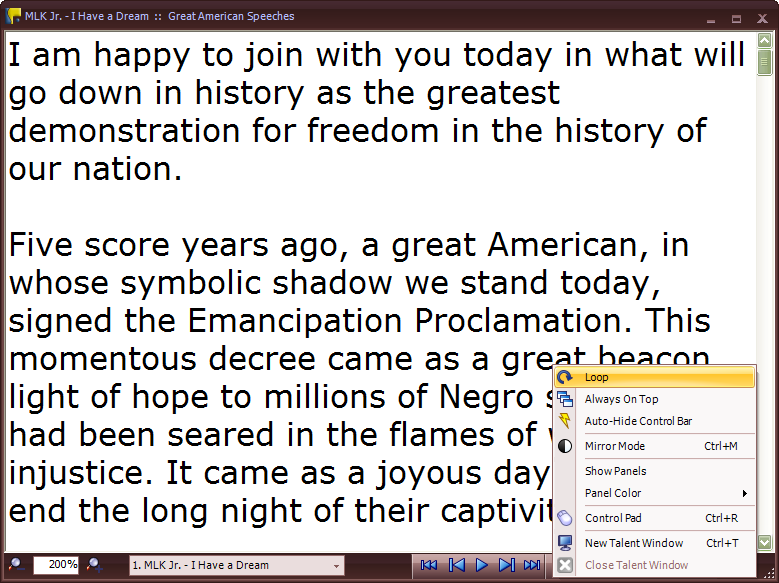 Key features included a tabbed wordprocessing panels, rich text with image support, Microsoft Word import/export, spellchecking and a thesaurus, color theme support, mirrored text in the teleprompter window, a remote teleprompter control pad window, multiple synced teleprompter views, extensive keyboard shortcuts, and even support for foot pedals and remote presenters. Several features were added over the years specifically at the requests of the user community. The app was available in Standard and Pro versions, and had special licensing for education customers. One particularly innovative feature was the availability of multiple tabs in the wordprocessing window. The tabs were called "segments" and were extremely useful to people who needed to easily jump between several distinct sections. Think: TV news anchor reading different stories ("segments") over the course of an evening program. Interestingly, this feature appealed most to schools reading the morning news over the PA and cover bands who would put different song lyrics on each tab. I'm quite proud of how polished the app was in the end given that my day job is UI design rather than programming. I learned a ton and really enjoyed working on this app. The project never made much money, but was a fun way to engage my creative tinkering side without having to buy a lathe and take up woodworking! My Role: UX designer, programmer (C#), marketing director, and customer support. I integrated a few third party software components including a wordprocessing engine, a UI component library, and spellchecking and thesaurus libraries. The user first entered text into a sophisticated wordprocessor window which supported rich text, cut/copy/paste, inserting pictures, Find & Replace, and so on. This UI was heavily inspired by the then-new Microsoft Word "Ribbon UI" design. Note the tabs for entering different segments for a news broadcast, different song lyrics for an evening's set, etc. I designed and programmed a sophisticated Find & Replace feature for the wordprocessing window. 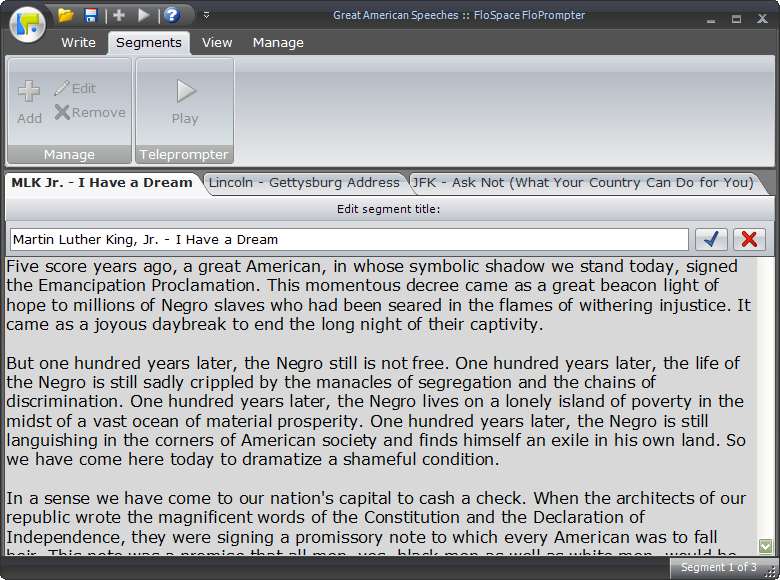 Instead of showing up in a popup dialog, the Find & Replace features were expressed in bars docked to the bottom edge of the window. I felt this approach was less intrusive and provided a better way for the user to maintain context. 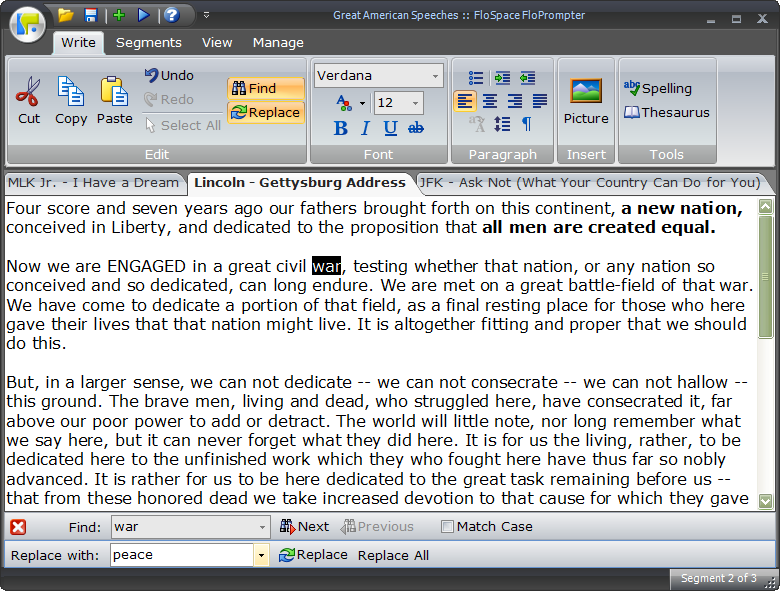 Uniquely in the teleprompter app market, FloPrompter supported tabs in the wordprocessing window. This feature was inspired by the needs of the original intended user base: podcasters. I figured that they would want to easily "mix & match" news segments in preparation for a single recording session. The user could easily add more tabs, move them around, and rename them. I conceived and designed the feature, and did all of the programming. 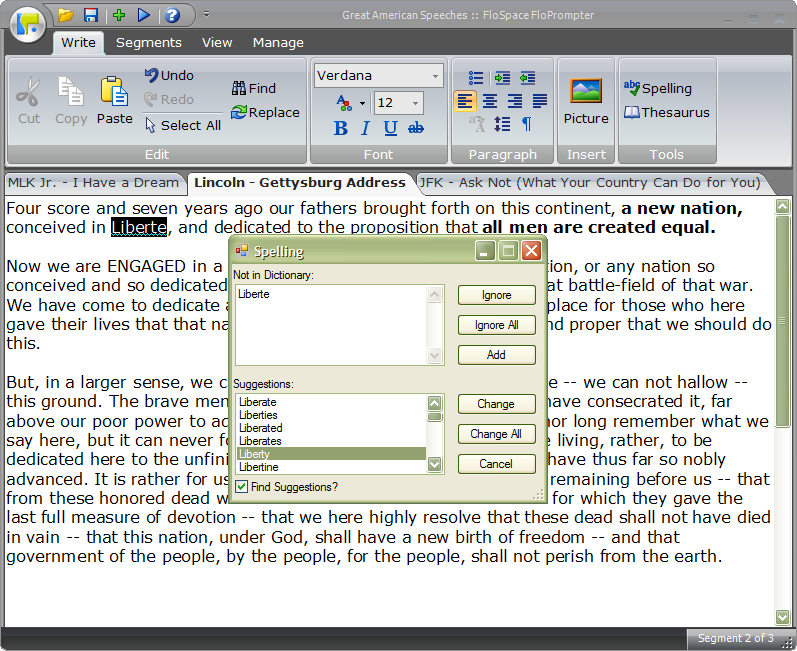 The wordprocessing window supported a rich assortment of user customization features. 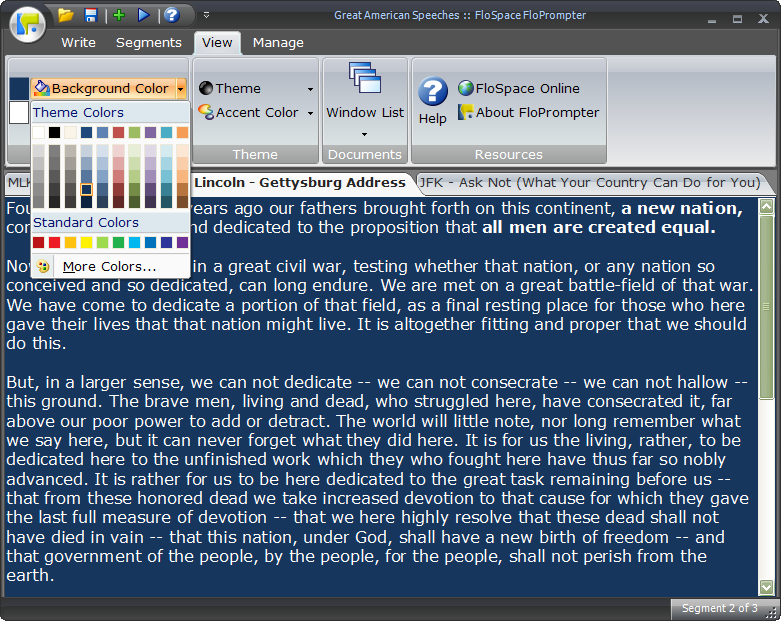 For example, the user could change the default background and foreground text colors in the wordprocessing window. 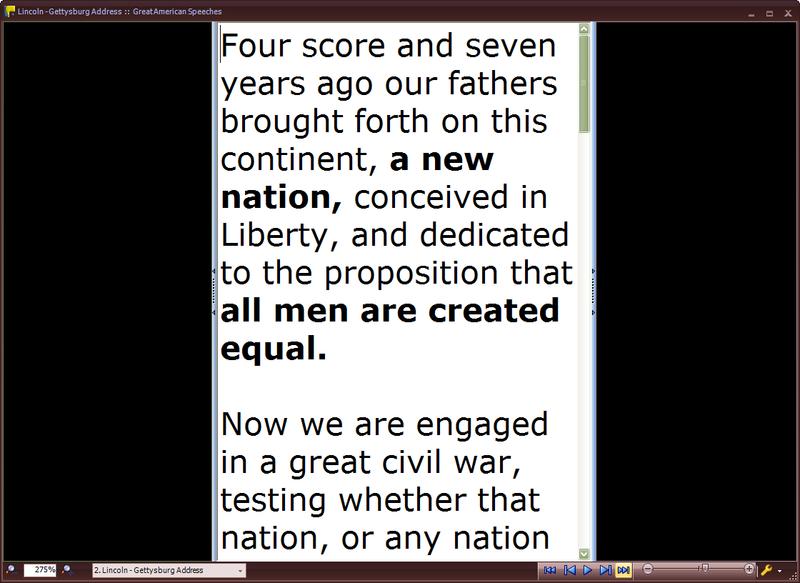 These colors naturally carried over into the teleprompter playback window, as well. 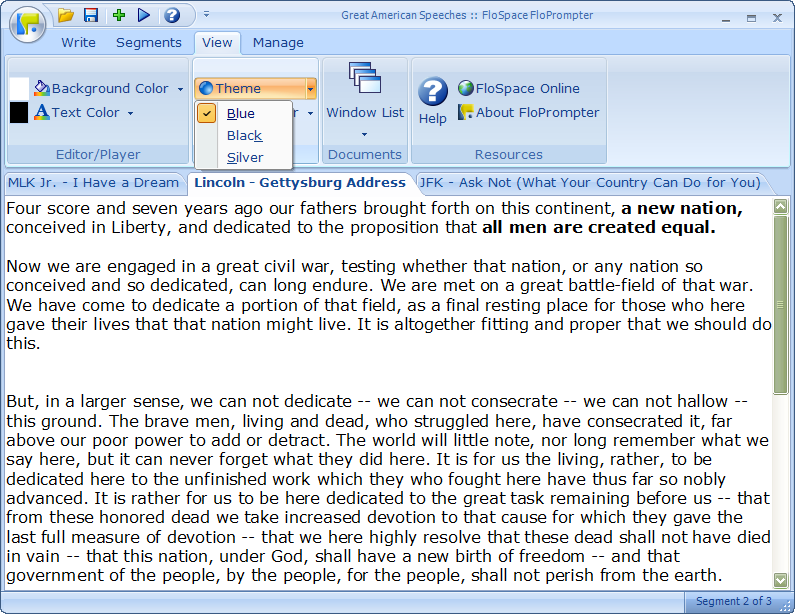 The look and feel of the FloPrompter app was heavily inspired by the then-new Microsoft Office Ribbon interface. I licensed UI components from a third party vendor which offered support for theming, so I decided to bring that feature into the app, as well. I'm proud to say that FloPrompter had the most beautiful UI design of any teleprompter app on the market. Its integration of the high quality UI components and theming was a big part of that. Uniquely in the teleprompter market, FloPrompter supported a rich set of spellcheck and thesaurus functionality. At the request of the user community (especially schools), I licensed SDKs for these features from third parties, then integrated the features into the wordprocessing window. The basic teleprompter playback window had a rich list of features to help users find the right playback speed, text size, automatically hiding the control bar at the bottom of the screen, and more. One of the features I added at the request of multiple users was the ability to "loop" the playback. This way, the playback would play through all of the tabs, then loop around and automatically restart indefinitely. This feature was requested by customers who used the teleprompter window to display announcements in an office lobby, for example. 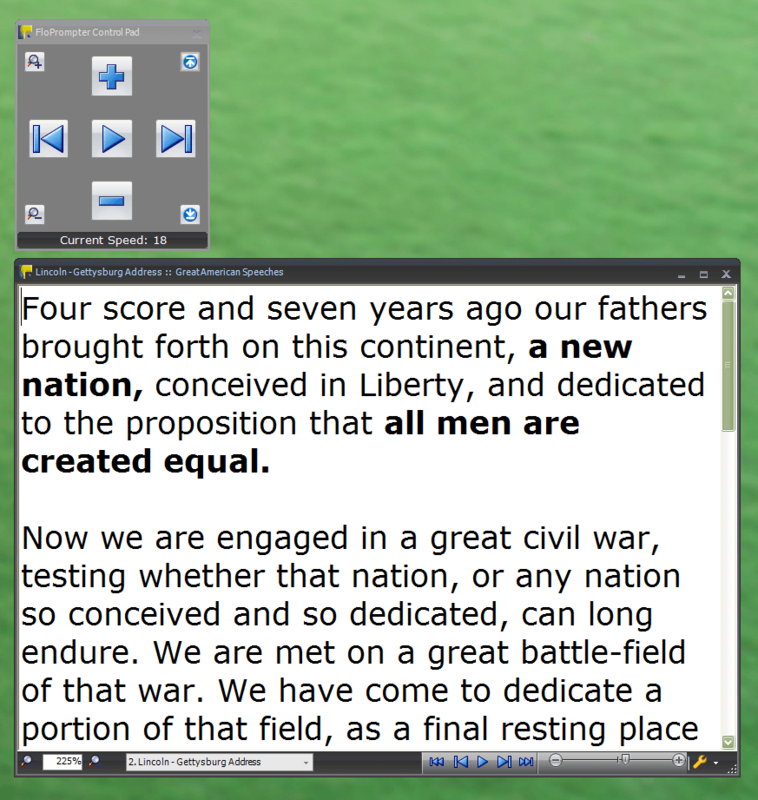 Here's an example of the teleprompter playback window which the user has customized by changing the background and text colors. 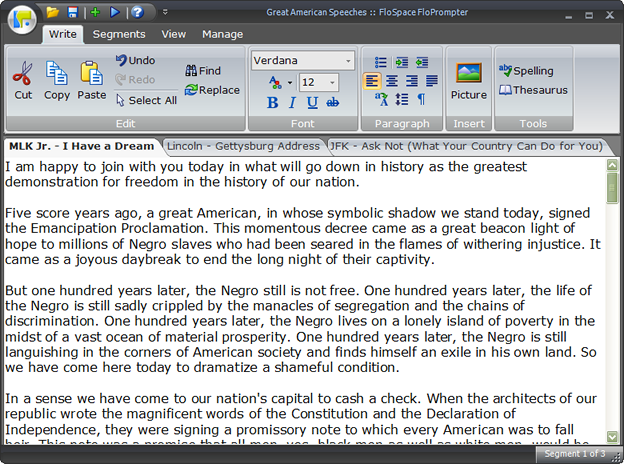 The default was black text on white, but users could change the colors as desired. 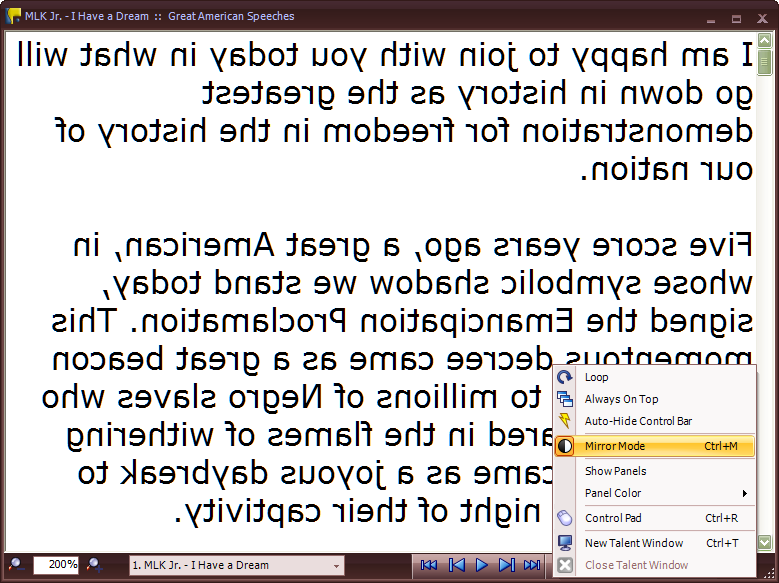 The teleprompter window offered a special "mirror mode" in which the text was displayed backwards. This mode was only available in the Professional Edition and was most useful when paired with professional display equipment. This feature was in high demand for customers working in professional recording studios. 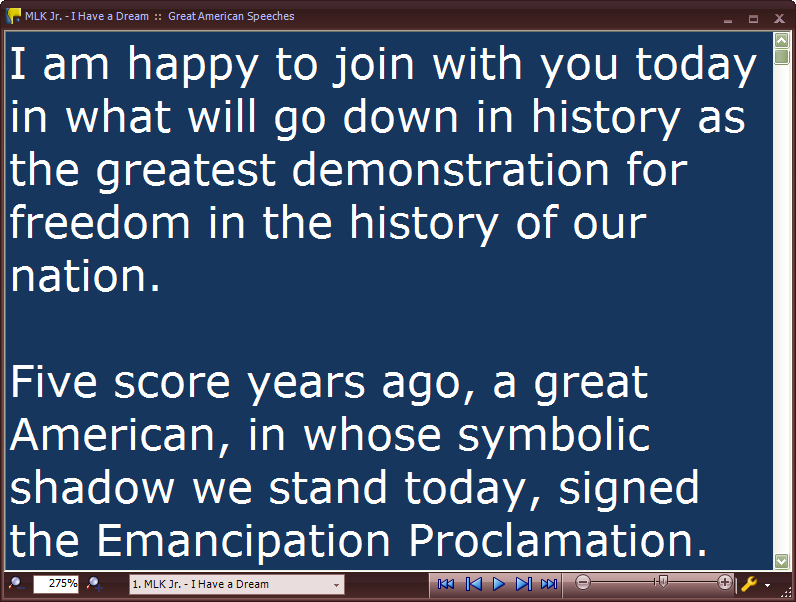 The teleprompter window displayed a scrolling region of text. The professional edition also featured these adjustable "blackout panels" on the sides so that the app would take up the entire screen, allowing the user to ignore background apps, windows, or other distractions. This feature was specifically requested by customers who worked on voiceovers and similar studio work. At the request of the user community, I designed and programmed a system of synchronized "talent windows." The user could create multiple teleprompter window instances, thus allowing the display of one or more synced windows on external monitors. Imagine a director in one room with the teleprompter window on one monitor, and a voiceover person ("talent") in a separate soundproof room reading from the second "talent window" on a different monitor. It was critical for the director to be able to scroll to a specific point in the text and have the "talent window" automatically sync to that same location. Another feature I added at the request of a user was a small "remote control pad window," as shown here. The control pad allowed the user to easily adjust playback speed, which tab's contents were currently showing, and more. This feature was especially useful for use cases involving multiple external monitors. In addition, FloPrompter included fantastic support for keyboard shortcuts (CTRL + a key), F keys (e.g., F5 for full screen mode), and support for foot pedals and wireless remote presenters. I programmed a rich set of file import and export functionality. 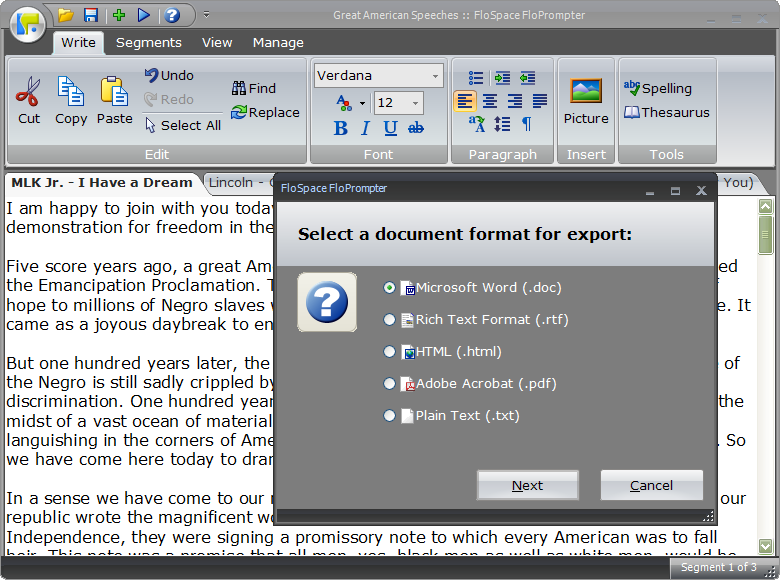 The user could import not only Microsoft Word files, but also other FloPrompter files. Additionally, I thought it was important to support a rich set of export options, including to Microsoft Word, Adobe PDF, HTML, etc. The program featured a rich set of user-configurable options. Some options were about general app behavior on the General tab, while other options were specific to behavior of the Teleprompter Window. I designed and programmed a sophisticated system for FloPrompter to check on the availability of software updates. 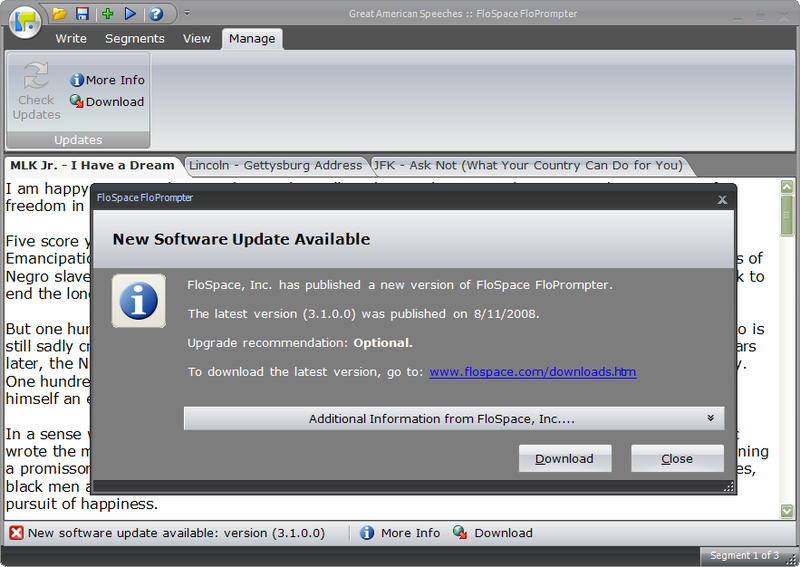 FloPrompter would automatically check for updates (if the user wished) and if a new update were found, prompt the user to view new features and download the new version.